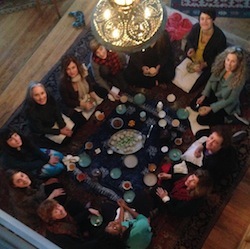 I am still basking in the afterglow of the women’s sensual retreat I just lead – an entire weekend of remembering ourselves as feminine beings, bringing reverence to our senses and emotions, honoring our need for rest and connection. That’s my intention for 2015. Receptivity – this powerful element of the feminine – isn’t passive. It’s active and intentional, yet open to the surprises of each day. But perhaps that love is bigger than romance and even relationships? What if every atom and molecule is love in physical form? Is each flake of snow falling around me this morning a crystal of love? Perhaps every breath I take draws in love as oxygen sustaining my body. Maybe the sun’s warmth and light, essential for our existence, is simply love as sustenance. CAN RECEIVING LOVE BE THIS SIMPLE? We can choose to receive love as we perceive snow, air, sunlight. What an elegant human design – that our senses are the conduits for delivery of this everywhere love. delivered to us through scenes of beauty, a kindness or daily synchonicities? Isn’t our challenge to be more awake to it all? the way morning pinks the sky. Imagine into love being all there is. How would you join me in receiving all the love this day has to offer you?